Nearest: Tube Station: Oxford Circus 0.3 miles (0.5 km), Railway Station: London Euston 0.7 miles (1.1 km), DLR Station: Tower Gateway 3 miles (4.8 km), Motorway: M1 Junction 1 5.2 miles (8.4 km). An amazing 7 underground stations within 0.5 miles (0.8 km) of the hotel. Sitting in an area known as Fitzrovia the Grange Langham Court Hotel is close to the West End of London. Just north of Oxford Street (300 yards) and walking distance to the major shopping along Regent Street. Half a mile from Soho famed for its restaurants and clubs. Oxford Street is one of the premier shopping roads in Europe with one of the highest densities of shops per square foot. There's something for everyone here and many shops are geared towards the London visitor. Although on the doorstep of central London just north of the hotel are some of the more suburban type districts such as Primrose Hill and Hampstead. Less than 500 yards north of the Grange Langham is Regents Park. A large open area with an outdoor theatre at its centre and housing London Zoo to its northern end. A good choice to be close to all the best known central London areas while being in one of the quieter districts. Saville Row is half a mile away just off from Bond Street, a small road synonymous with the best in tailored and designer men's suits. The Grange Langham Court Hotel blends traditional standards with classical elegance. The delightful decor of each guest bedroom is enhanced by the addition of a computerised door locking system, luxurious marble bathroom, iron/ironing board, trouser press, hairdryer, television with satellite channels, radio and direct dial telephone. 24 hour room service is naturally available. Floors have lift access. Complimentary newspaper. All rooms en-suite. Langham's Brasserie: Serving French dishes and has an extensive wine list. Vino Latinos wine bar is the perfect place to unwind. With its informal atmosphere and a cosmopolitan menu. Enjoy lunch, brunch, pre or post theatre dinner. You can also enjoy a drink, afternoon tea or a cocktail at the comfortable Foley's Lounge Bar, a relaxed and casual atmosphere. Open 24 hours. The front desk is always open to guests, 24/7 while porters are on hand 24 hours. A safe is available for guest use at reception. There are 2 meeting rooms able to accommodate up to 100 delegates. Wireless internet access can be picked up throughout the hotel (charges apply). Grange Fitzrovia Hotel: is 309 yards (282 metres) away, has a guest satisfaction score of 75% and rates start from about £86. Grange Blooms Town House Hotel: is 0.7 miles (1.1 km) from here, earns a customer rating of 82% and base rates begin at about £86. Grange White Hall Hotel: 0.7 miles (1.1 km), rated at 74% and with rates from around £75. Grange Portland Hotel: 0.8 miles (1.2 km), rated at 82% and with rates from around £86. Compared to other London hotels: This hotel has been rated 73% by past guests. The London average is 80% and the average for 4 star hotels is 83%. Therefore this hotel is below average for its sector (star rating) . Grange Hotels across the chain average 79% so this hotel is below the average guest rating for Grange hotels. Milesfaster ranking: 701st from 866 London hotels, 13th of 13 Grange Hotels, and 305th of 328 four star rated hotels. 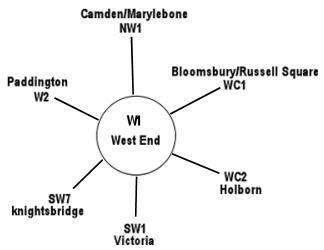 The 50 hotels nearest to this location (31-35 Langham Street, W1 postcode) that we list cover a 0.7 miles (1.1 km) radius. The 50 are made up of 16 five star hotels (average rating 88%), 25 four star hotels (average rating 82%), 8 three star hotels (average rating 79%) and 3 two star hotels (average rating 67%). Top 4 star hotel is The Nadler Soho at 96%. Coming out as the top rated hotel are Soho Hotel (5 star) and also The Beaumont London (5 star) (both joint top with 99%). Of the nearest fifty hotels we have base rates for all of them. The average rate for all the 50 nearest hotels is £172 per night. Starting from £18 at SoHostel (2 Star, 80%) up to £475 at Rocco Forte Brown's Hotel (5 Star, 90%). Averages by star rating: Five Star average: £307, Four Star average: £130, Three Star average: £86 and Two Star average: £43. We use a proprietary algorithm to rank hotels based on user reviews but adjusting for contributing factors. We rank Grange Langham Court Hotel 46th (joint) of 50 nearby hotels and 23rd (joint) for the 25 four star hotels in the area. In terms of lowest starting rates this hotel is 11th of 52 (4th of 25 four star hotels.). Analysing both the base rates and overall rating for the hotel we rank it 39th of 49 for sheer value for money (SoHostel was top). History: Major restoration work in 1989. The hotel was once the Howard de Walden Nurses home and at another time The Langham Street Clinic which carried out abortions.